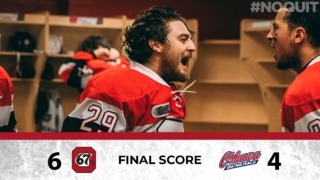 It took an overtime marker from Austen Keating for the Ottawa 67’s to see off the Mississauga Steelheads 4-3 Friday evening at the Arena at TD Place. The barber poles relied on a strong performance from the line of Keating, Graeme Clark and Tye Felhaber. The trio combined for eight points and were flying all night. Ottawa got on the board first following a textbook breakout. Felhaber flew down the left wing and tried to centre the puck to Keating, but it deflected off an opposition stick and into the net for the first goal of the season. The Steelheads responded less than five minutes later, with Czech import Filip Reisnecker scoring his first career OHL goal. The first frame would end knotted at one. 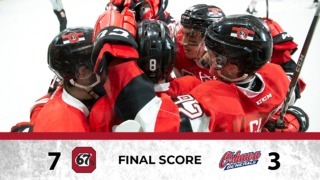 The 67’s retook the lead midway through the second period. A hard Ottawa forecheck created a turnover and Keating got the biscuit to Graeme Clark in the slot. Clark snapped a shot into the back of the net, leaving goaltender Jacob Ingham no chance. Mississauga turned the game into a back-and-forth affair, as they again tied the score moments later. A strange sequence in the Ottawa defensive zone somehow resulted in Steelheads forward James Hardie jamming the puck over the line. Some great hand-eye coordination allowed Ottawa to take the lead again. Mitchell Hoelscher batted a knee-high pass from Felhaber into the net with the second period coming to a close. The game of copycat continued in the third when Steelheads defenceman Ryan Barbosa fanned on a point shot. The floating puck hit the stick of Richard Whittaker, who took credit for tying the game. Despite a couple of late chances for both sides, the Whittaker marker was the only scoring in the third period and the contest went to overtime. The extra frame didn’t even last a minute before Ottawa’s usual suspects sent the fans home. Felhaber showed great patience to fake out Ingham on a two-on-one and calmly slide the puck to Keating for an easy tap-in. The 67’s honoured the 1998-99 Memorial Cup champions team before puck drop. The Memorial Cup trophy was on hand, as well as several alumni from the championship squad. The first period was delayed roughly 30 minutes due to fog in the arena. Ottawa took seven penalties in the game, but managed to kill them all off, including a lengthy 5-on-3 at the beginning of the third period. Mississauga took a lone penalty and Ottawa failed to capitalize. Ottawa netminder Cedrick Andree turned aside 31 of the 34 shots he faced. Jacob Ingham of the Steelheads gave up four goals on 24 shots. Four 67’s made their OHL debuts, namely Cameron Tolnai, Matthew Maggio, Jack Quinn and Marco Rossi. 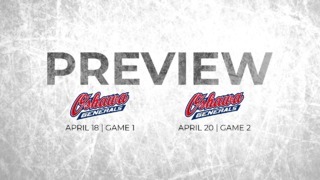 Ottawa will then embark on a four-game road trip.